Here are the Top 20 Automotive Stories since 1998, compiled in conjunction with our partners at the Society of Automotive Historians, Henry Leland Chapter and voted on by MotorCities' weekly e-newsletter subscribers and followers on social media. 20. Consumers are keeping their cars longer, or buying used cars rather than new ones, while auto company executives and designers begin pushing more radical innovations to attract sales. 19. Leasing vehicles becomes more popular as a national law was passed regulating the practice. 18. Foreign automakers, notably Mercedes-Benz and BMW have invested more of their efforts and money into U.S.-based operations. 17. Beginning in 1998, personal GPS devices are sold, greatly increasing navigational abilities for drivers and aiding emergency efforts such as rescues. 16. As gas prices begin to rise, gas-guzzling brands such as Hummer lose popularity and eventually cease production. 15. Car hobbyists witness a surge in parts costs as demand increases, and manufacturers push expensive OEM parts. 14. In 2001, Satellite radio, powered mostly by Sirius and XM (who eventually merge), provides commercial-free, static-free radio with more programming variety than terrestrial radio. 13. In February 2014, GM issues a recall for faulty ignition switches, which have been linked to over 120 deaths. 12. The stick-shift begins fading away, as less than half of all new vehicle models in 2006 offer manual and automatic transmissions. Today, less than 3% of vehicle sales involve manual transmissions. 10. Ride sharing companies like Uber, the utility of drones, delivery services and other innovations cause radical changes in the mobility industry. 9. Globalization, a major influence over business for centuries, really takes off over the last 20 years, as auto companies become increasingly integrated with the rest of the world and find new markets to reach. 8. November 2008: The first of many recalls of Takata airbags is announced after multiple deaths. 7. In 2009, Google begins testing autonomous vehicles, sparking the interest of other companies such as Tesla, and putting autonomous vehicles at the forefront of innovation. 6. Firestone officials found that their Ford Explorer tires had treads and belts falling apart, resulting in their tires being tied to nearly 150 deaths and severing their century-long partnership with Ford. 5. In April 2004, Oldsmobile, one of the oldest surviving car brands of all time, is discontinued by General Motors. 4. Consumers started buying pickup trucks, like the Ford F-series, as personal vehicles, rather than work vehicles. 3. Between 1998 and 2009, Chrysler migrated through a series of owners, including Daimler-Benz in 1998, Cerberus Capital Management in 2007 and ultimately Fiat in 2009. 2. In the 2000s, several iconic brands, including Pontiac, Plymouth, Mercury and many others, are discontinued for various reasons, primarily lackluster sales. In his 60 years of service in the U.S. Congress, Mr. Dingell championed influential legislation to support all sectors. He authored and co-sponsored the Automobile National Heritage Act in 1998 to create what is now the MotorCities National Heritage Area. Dingell retired in 2014, and in 2015, he was the inaugural recipient of the MotorCities Milestone Award, recognizing all of his contributions. Since the creation of the heritage area, Dingell has been its most vocal advocate imploring the organization to work to tell the story of the region and its people. Automotive pioneers like Ford, Chrysler, Buick, Durant and the Dodge brothers were central to the concept of recognizing automotive history across the region. Donn Werling, former director of the Henry Ford Estate – Fair Lane, saw the importance of intertwining the story of Henry and Clara Ford’s home with other institutions like The Henry Ford, Meadow Brook Hall and the Edsel & Eleanor Ford House. It was that collaboration that brought light to the concept that the story of the region's auto history is shared across many communities and all of these icons of the past have a role in that story. Werling took that concept and helped lead the efforts to establish the Henry Ford Heritage Trail, which expanded to the establishing MotorCities. When Werling retired in 2002, he was honored with a MotorCities Cornerstone Award, having been so instrumental in jump-starting the National Heritage Area. Deb Locke-Daniel fits the profile of the leadership of MotorCities NHA (and most non-profit boards): they sacrifice from their already full personal schedules to contribute to their chosen organization. Deb was Executive Director of the (then) Ypsilanti Area Convention & Visitors Bureau (YACVB) and also chair of the MotorCities board at a most critical time. When she assumed the seat in 2013, the original legislation that funded the heritage area was set to expire in 2014, so she spent countless hours working with the board and office team on the strategy to get reauthorized. Thanks to the understanding and support of the YACVB, she was able to devote the time necessary to be the driving force behind the reauthorization. In her remaining time, she also supported a three-year strategic plan for MotorCities before retiring from the YACVB in 2016. Hudsons have been sold at Miller Motors in Ypsilanti since 1929. Jack Miller is the son of the owner and began working for his father in the 1950s. MotorCities offered the opportunity to move Ypsilanti's auto story to the forefront. Miller Motors became the home of the Ypsilanti Auto Heritage Museum while still operating as the last Hudson dealership and parts dealer. It was Jack's enthusiasm that galvanized the Ypsilanti auto community to make sure that the story was not overlooked as one of the true "Motor Cities" of Michigan. Jack was curator of the museum until retirement, though he remains the expert on all things Hudson (a title he will not relinquish!). Don Nicholson seems to have discovered the 25th hour of the day or the 8th day of the week. He serves on more than a dozen community boards, committees and commissions, while also building and promoting major auto events. When Nicholson first became aware of MotorCities NHA in 2007, he reached out to see how he could be involved. He started by attending community meetings, taking a seat on the Stewardship Council and getting elected to the board of directors. After years of service on the board, Nicholson has assumed a role on the Executive Committee and become fundraising chair. If that commitment weren’t enough, Don is the first person to volunteer to spend time traveling across the region talking to the public about MotorCities and its work. His goal has been to draw more people to become involved with MotorCities, which is truly the definition of a champion. U.S. Representative Debbie Dingell is admittedly a "car girl through and through," being a descendant of the famed Fisher brothers who started Fisher Body in the early 1900s. At the time that the heritage area was being proposed, Dingell worked for the General Motors Foundation and made certain that the initial resources were in place to support this ambitious effort. In the years since, she has championed the cause as the Chair of MotorCities' Leadership Council, an advisory committee of leaders from across the region. She is now continuing the 80+ year Dingell legacy of service as a member of Congress representing Michigan's 12th District. When MotorCities was being created, there was a lot of talk about Detroit as the "Motor City," however, it was Sandra Clark who said that the story is so much bigger. In her role as Director of the Michigan History Center, Clark added the true statewide perspective. There are elements of the auto story that reach from Michigan's Upper Peninsula to its southern border, and all of those stories should be told. Her leadership was critical in receiving the state's endorsement in order to move up to consideration for the heritage area. Clark went on to serve as chair of the MotorCities Board of Directors and continues to advocate for the state's auto history. One of the original adopters of the Stewardship Community concept, Thompson has worked to help all the communities she touches. Whether they were related to her professional work with Oakland County or volunteer projects driven by her passion, her goal has been to help projects in the incubation stage and then stand back to watch them flourish. She has been responsible for more than 100 of MotorCities' wayside exhibits, with the largest concentration in Pontiac, along with other Oakland County communities. The concept of the MotorCities National Heritage Area had started (as most do) with a group of concerned and active community partners. However, there was a need for someone to connect those efforts across the public and private sector. Ed Bagale was that connective tissue, given his role as Vice Chancellor at the University of Michigan Dearborn. The key to partnership is getting people in the room to get them talking and then keeping them talking until something great happens. Bagale served as MotorCities' first Board President and remained on the Board until he retired in 2014. He passed away in 2017. It is romantic to say that a group of people rallied together to launch our National Heritage Area. However, there was tremendous amount of work organizing and planning to deliver on the vision of the founders. As MotorCities' first executive director, Bodurow had the task of orchestrating the partnership through the process of discovering what it was going to be and how it would ultimately fulfill its mission. Hundreds of meetings led to the creation of the general management plan, a document containing all of MotorCities' hopes and dreams. Working with the founders and board members and building a staff to execute the plan all came under her tenure. She had to live, eat and sleep it to make sure things worked. After 20 years, it looks like the time was well spent. Having fostered a greater appreciation for her hometown auto heritage working in Japan, Darga became focused on helping save the Ford Village Industry Plants slated for demolition. This effort, while she worked for Wayne County Parks in the 1980s, launched the idea the Ford Heritage Trail, a brochure designed to tell the stories of these sites. Through her efforts, almost all of the mills were saved from demolition. Darga went on to be one of the founding members of the MotorCities National Heritage Area and championed its cause on every level, as a member of the Rouge Stewardship Community, board of directors, and as executive director. Now, to bring things full circle, she is the Executive Director of the Ford Piquette Avenue Plant, birthplace of the Model T.
It feels like the MotorCities National Heritage Area and Overland grew together. He started as an eager intern at the Henry Ford Museum and worked hard every day for 20 years to rise to Executive Vice President and Chief Historian. But if you ask Overland, that ascent was only viable because of all of the people and partners he was touched by along the way. Working with MotorCities provided a unique opportunity to expand the reach of The Henry Ford and tell the story of Michigan's automotive heritage across the globe. Blackman caught "The Bug" of auto collecting more than 60 years ago. When the concept of the MotorCities National Heritage Area came along, he saw the perfect opportunity to combine his love for the car hobby with his interest in history and education. Blackman is one of the few to have the distinction of signing the original Articles of Incorporation to start the organization we now know as MotorCities. Having taught at Michigan State for more than 30 years, he was well-positioned to convene the Lansing area MotorCities Stewardship Community and lead many successful projects. Even at 93 after six decades enraptured in the hobby, Blackman is still an ardent champion for the Lansing community and the continued growth of MotorCities. In 2017, he became only the third recipient of the MotorCities Milestone Award. MotorCities was always meant to tell a broader story about the region. It required support from municipalitiies across the state. Congressman Upton played a critical role in extending the heritage area west into Kalamazoo. Some Michigan natives can say that the auto industry is in their blood, but for Bill Chapin there is no denying the lineage from his Grandfather Roy Chapin Sr. (a co-founder of the Hudson Motor Co.), his father Roy Chapin Jr. to forging his own legacy. Bill was just finishing up work on the launch of the "Motor City" exhibit at the Detroit Historical Museum when he stepped back to realize that these stories are relevant to today. The stories of industry leaders and rank and file workers were all there to inspire generations to come. It was around the same time that he became aware of the efforts to codify that story in the region via the creation of a National Heritage Area. Bill was there when the bill was signed. He signed the articles of incorporation, served as board chair and continues to be a flag bearer for all that MotorCities represents. In 2017, Bill retired as President of the Automotive Hall of Fame. Beida has always a personal passion about serving the people of Michigan. The MotorCities enabling legislation authorizes us to tell the story of the automobile industry and labor. The labor story focuses on the people who worked in the industry, who fought and struggled for elements of the American lifestyle that we enjoy today. Bieda has always been connected to serving those people with a particular focus on that labor story. As Detroit was approaching its 300th birthday, Steve was key to the planning of "Transcending," the labor legacy landmark in downtown Detroit. He has served as both a Senator and Representative of his local district in the Michigan state legislature since 2002. He helped found and co-chairs the MI Legislative Auto Caucus, providing a forum for legislative discussion about all matters related to the auto industry in the state. It was in partnership with that caucus that MotorCities launched the Michigan Auto Heritage Day and Awards of Excellence in 2014. Senator Levin stood as a giant in the U.S. Senate for 36 years. Having worked in an auto factory, he appreciated the power of the industry and the pride of its people. It was a no-brainer in 1998 to support the movement to establish the National Heritage Area. But, perhaps his largest contribution came in one of his last acts in office. In 2014, when the original funding authorization for MotorCities had expired, it was Levin who championed extending it, allowing our organization to survive. He retired at the end of that term. In 2016, Senator Levin became the second recipient of the MotorCities Milestone Award for all of his support and contributions. MotorCities has been so fortunate to have strong board leadership since its inception. Bob Kreipke continues that lineage as the current Chair of our Board of Directors. Having spent 40 years with Ford, the last decade+ as their Corporate Historian, Bob has an immeasurable appreciation for history. When it comes to MotorCities, Kreipke would tell you that we are in a unique position. Though our auto companies represent more than a century of heritage, the companies are often limited to looking at what is new and next in order to support next year's model. MotorCities can celebrate that heritage, embrace those histories and weave them together as a neutral voice. In retirement, Bob is driven by the opportunity to share those stories to a new generation by making MotorCities stronger and more relevant everyday. When Shawn Pomaville became Executive Director in 2013, she was brimming with excitement at the opportunity to return to her native Michigan and take on such a unique position. She was also met with a daunting task, to navigate MotorCities through a reauthorization process with the original authorizing legislation expiring just as she was taking the helm. Shawn went right to work organizing efforts locally and in Washignton D.C. to make sure that everyone knew just how impactful MotorCities has been. Since she arrived, Shawn has worked tirelessly every day to connect board, team and community to ensure we deliver on our mission and are accountable to tax payers. She has expanded staff and capacity; revamped our grant program; and launched new events like Michigan Auto Heritage Day and Motor Boats & Motor Cars. When asked about the challenging and exciting parts of the job, she answered both questions the same: "Every day is very different, and you are working in a living cultural landscape of American history." In championing the efforts of MotorCities, no two days are ever the same. MotorCities National Heritage Area covers 10,000 square miles, touching parts of 16 counties and 1 Canadian province. The story is even broader, touching every element of communities from its roads to its homes and people. The wayside exhibit program seeks to tell the stories of the people, places and ideas that made these communities and our region great. The project started with a grant from the Michigan Department of Transportation via the Federal Highway Administration. The project was truly driven by the people of these local communities who dug deep into their archives and treasure troves of memories to immortalize their stories. Since 2008, we have installed 270 of these interpretive exhibits around the heritage area, and there is no end in sight. Learn more here. After the heritage area was established in 1998, there was a need to assess the assets. MotorCities worked with the Land Information Access Association (LIAA), and after hundreds of meeting hours, a small army of dedicated enthusiasts worked to survey more than 1,000 auto and labor heritage sites across the region. These museums, homes, factories, union halls, cemeteries and landmarks constituted the pieces of the mosiac that would make up MotorCities. It is not often that a brand makes it to 100 years, but Oldsmobile reached that milestone in 2004. Its namesake, Ransom Olds, called Lansing home, so it was only appropriate that the community mark the occasion with a mural in tribute to Ransom and his impact on the Lansing community. The mural was painted in the aptly named "REO Town" section of the city. In 2014, after 10 years of wear and tear, the community again rallied to update the mural to tell even more of the REO story. It will be soon be reinstalled on the south wall of the Impression 5 Science Center. The auto industry provided a new opportunity for those who lived in Michigan, as well as those who traveled from near and far. MakingTracks.org looks back at the African American experience in the auto industry. This culture represented the migration of workers and families to the Motor Cities. Their work was hard, and their paths were not smooth. The website talks about adjustment to the north; the climate in their communities and treatment at their jobs. 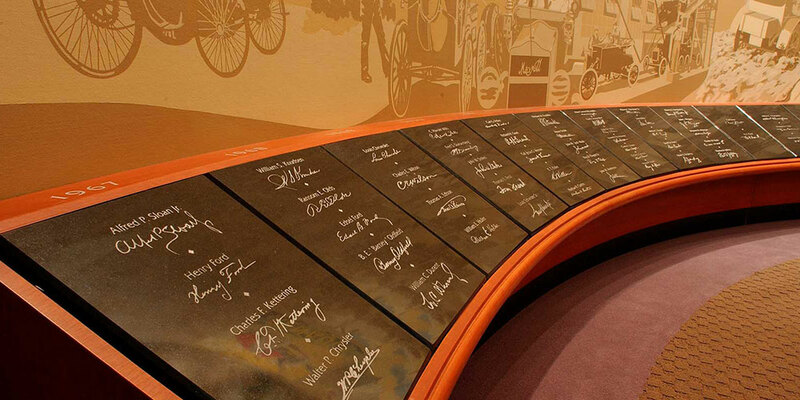 It also highlights the triumphs and tragedies of a people who contributed to building the auto industry. "The Year of the Car"
1908 was quite a year in the auto industry. Little did they know that the car that changed the world and the largest auto manufacturer in the world would both burst onto the scene a mere few days apart. In 2008, MotorCities spent a year recognizing the iconic Ford Model T as the car that put the world on wheels, as well as celebrating the centennial of General Motors as they looked forward through the lens of GM Next. There were lectures, student contests, books and special events to commemorate a year that should never be forgotten. After the monumental push to establish the heritage area, there came the task of how to approach managing activity across the 10,000 square miles. Over a series of community meetings and hundreds of hours of work by the small but dutiful staff, a guiding document was created. The organization's general management plan was approved by the Secretary of the Interior in 2002. It represented the blueprint of the what the Automobile National Heritage Area would be and the goals and aspirations for all of the things that it could become. In 1899, a series of arches was erected down Flint's main street, Saginaw St. This installation was touted as the first to bring electrical lighting to a main street in the country. In 1905, the "Vehicle City" moniker was added to one of the arches to pay homage to the many modes of transportation being produced in the city. Whether it was carriages, bicycles, cars, buses or trucks, Flint could lay claim to them all. The arches were removed in 1919, and in 2002, a group of citizens began the plan to resurrect the arches as they appeared a century ago. MotorCities was proud to support the effort with funds from its grant program. The first arches returned in 2003, and the last of the 11 arches were installed in 2008 during the GM Centennial. They stand today as a statement that there are many motor cities around the region, but there is only one "Vehicle City" and that is Flint, MI. With the growth of the young auto industry, there came the need to address the rights of the workers and community that the industry supports. The story of the labor movement has seen many twists and turns over the years. It is important that we take a look back at the past to bring focus to the future. In 2017, MotorCities and the Michigan Labor History Society worked together to present "Building the Engine: Auto and Labor, 1932-1937," a year-long recognition of the seminal auto labor moments from those years. Those events, including the 1932 Ford Hunger March, the formation of UAW in 1935, the Flint Sit-down Strike in 1936-37 and the Lansing Labor Holiday in June 1937, were all examined through lectures, tours, events, exhibits, and articles chronicling the triumph and tragedies of those years and what we are still learning form them today. One of the things that draws visitors to the MotorCities National Heritage Area is the authenticity of the historic resources. There is no place in the world with a higher concentration of automotive and labor sites. One site that truly reflects the efforts of the heritage area is the Ford Piquette Avenue Plant. This is the first factory that Henry Ford built for the Ford Motor Company. It is the birthplace of the famed Model T, the vehicle credited with making auto ownership an affordable reality in the early 20th century. Over the years, MotorCities has supported projects like its master planning, facade restoration, roof repair and fire suppression system. All of these projects assure that this National Historic Landmark is there for the tens of thousands who visit each year from around the globe. They relish standing in the same space where ideas and innovation changed the world. Auto heritage tourism represents a huge portion of the $481 million economic impact attributed to the MotorCities National Heritage Area. More than the economic impact, the major automotive events represent the cultural magnetism of our region. Visitors travel to the region thoughout the year for tent pole events like the North American International Auto Show, Autorama, Back to the Bricks and the Woodward Dream Cruise. Beginning in 2007, MotorCities partnered with the Detroit Metro Convention & Visitors Bureau to unite these automotive event partners with an outreach program called Autopalooza. The program brought these events together to share best practices and engage in joint marketing to shine an even brighter light on the region. It connected visitors of one event to the opportunity to visit other communities and events later in the season. Over its 10 years, we are proud to say that Autopalooza drove thousands of visitors to our region and improved the awareness, support and cohesion of these events -- allowing all to rise together. In 2014, MotorCities launched Michigan Auto Heritage Day. This day also features the annual MotorCities Awards of Excellence, which recognize outstanding auto-related projects from across the region that have excelled in heritage tourism, preservation or education. The inaugural awardees from 2014 are pictured with Executive Director Shawn Pomaville (left) and Board Chair Deb Locke-Daniel (right). The launch of the special day also marked the creation of the Michigan Legislative Automotive Caucus. It is difficult not to find a person who is not touched by the auto industry in MIchigan, so it is not hard to understand why this caucus makes sense to a legislature that boasts more than a century of automotive history. From some people's perspectives, cars provide pure utility. They get you from one place to another. Sometimes classic cars provide entertainment or recreation as a nice weekend hobby. In the case of Gilmore Garage Works, cars provided invaluable life lessons. In 2012, MotorCities supported a grant to the Gilmore Car Museum to connect at-risk, Kalamazoo-area high school students with local mentors as they worked together on classic automobiles. The incentive was that you needed to remain enrolled in school in order to continue in the after-school vehicle restoration program. What the students learned about body repair and internal combustion engines paled in comparison to what they learned from auto engineers and professionals from their community who showed them a world of possibilities. The program continues to be a success and now includes recently graduated students now acting as professional mentors. Though we work at it everyday, it is difficult to frame how influential the auto industry has been on our culture and way of life. Just one example is our concept of recreation. The advancement of cars necessitated roads, and roads connected cities and people. The ability to travel with relative ease allowed those who were now making a fair income to drive their new automobiles to places that would have otherwise entailed many hours of travel. The idea of road trips and weekend getaways was far more attainable. Edsel Ford, son of Henry Ford, was able to have a 2nd "getaway" home called Haven Hill in what is now White Lake. This land is now part of the State of Michigan's Highland Recreation Area, having been donated by Eleanor Ford. The property entailed a number of buildings (garage, barn, lodge house, etc.). Though some of those structures have been lost or compromised, there is still a story of an auto magnate and his family sitting by the fire in the lodge or their children running through the trails. The Friends of Highland Recreation Area endeavor to tell that story. Over the years, MotorCities has supported multiple grants to restore and repair parts of the property, as well as installing interpretive signage throughout. Visitors today can stand where Edsel Ford's lodge stood and think back to how he and his family took a little break at what he called his "nerve retreat." It is difficult to imagine a time when icons like Chevrolet, Buick, Chrysler, Olds, Dodge, Ford and Leland were all working to find their place in this relatively new automotive industry. Whether it was cost, style, audience or craftsmanship, they were all contemporaries who were fighting to distinguish themselves from their competition. One name that stood out and became synonymous with luxury and reliability was Packard. The company began manufacturing in 1899. Aside from the Packard Plant in Detroit, the other vestige of the Packard Motor Car Company that remains is its proving grounds in Shelby Township. Not to be overlooked was the need for these auto companies to test their innovations in a controlled, yet real world setting. Originally, this 560-acre site was the place where Packard would test their vehicles for reliability and comfort in order to ensure buyer satisfaction. Today, the Packard Motor Car Foundation operates 14 acres of the original property, which was gifted by Ford Motor Company. This portion of land includes the remaining historic structures (lodge, engineering building, garage, hangar), and MotorCities has supported grants for restoration or renovation of many of those structures. It is easy to stand in the garage and imagine the work that went into calibrating the highest quality. If you ever question the quality of a Packard, as their ads stated, simply "Ask the man who owns one." The story of the automotive industry has touched many generations. It has built communities and allowed families to flourish. The appreciation for the accomplishments of auto and labor must be passed along so as not to be forgotten. That was the exact intent in 2002 when the UAW began their support of MotorCities' educational programming. The educational outreach was aptly titled the Stephen Yokich Education Program, in honor of the former UAW President who had recently passed away. The goal was to bring these stories of ideas, innovation, social change, triumph and tragedy to schools across the region. After the first wave of schools engaged, the program expanded to a web-based curriculum called MotorCities KidZ, which served to inspire a new generation of auto enthusiasts. Every preservation project begins at a different point and may launch with different motivations. Some are emergency intercessions that literally make the difference between saving a building and letting it crumble. Others are an opportunity to reclaim a piece of history that may have lost its luster. In the case of the Cherry Hill Village Center in Canton, the motivation was to restore an original Henry Ford Village Industry site to its former prominence. In 2012, the Partnership for the Arts & Humanities acquired the Cherry Hill factory, one of Ford's famed factories, where he didn't just develop the production facility, but the entire surrounding area. There would often be schools and homes built near these factories to accommodate children and families. In the case of Cherry Hill, Ford purchased the dormitory for disabled veterans working at the factory, which supplied parts to the larger Willow Run Plant. We are proud to have supported multiple grants over the years from master planning to window replacements. The Partnership is restoring the factory and dormitory building with the purpose of providing services and programming for veterans once again. In no particular order, here are 20 Significant Domestic Vehicles produced since 1998, compiled in conjunction with our partners at the Society of Automotive Historians, Henry Leland Chapter, with car number 20 nominated and voted on by readers of MotorCities' weekly e-newsletter and followers on social media. 2008 Dodge Challenger, which reignited the pony car wars with a major jolt.